Extended warranty from 3 up to 5 years for many different brands. 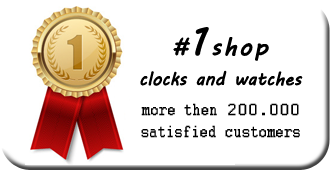 We offer a 5 year warranty for all home clocks over 1500 € or 1170 GBP. It is up to 3 years over the legal guarantee offered by the manufacturer. For selected brands, we extend the legal warranty to one more year up to 3 years at no extra costs. This free service is offered exclusively for Timeshop4Yous customers. Within the warranty period we provide the support on defects movements or striking mechanisms of your clock. Within the warranty period we provide the support on defects movements or striking mechanisms of your clock. The warranty does not cover: battery, glas, case, strap or bracelet, damages resulting from improper handling, lack of care, accidents, normal wear and tear. The warranty period runs from date of invoice.